Large bottles are perfect for parties! This vintage marks 38 years of Sin Zin at Alexander Valley Vineyards. Our first vintage in 1978 was given out to family and friends, quickly attaining cult status among those lucky enough to receive a few bottles. Everyone loved the spicy flavors, memorable name and risqué label. 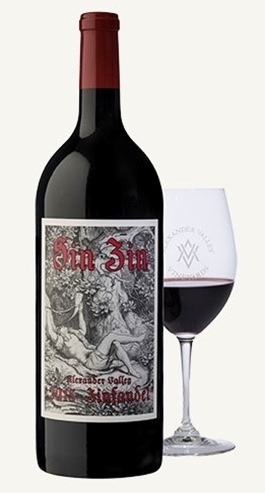 The wine was so popular, that in 1980 we offered a few cases for sale and Sin Zin quickly became a cult classic. Sin Zin is an elegant style of Zinfandel, due to our growing region and winemaking style. We harvest grapes from throughout the Alexander Valley - including the valley floor, hillsides and benchlands looking for a balance of ripeness and acidity in each lot to show-case our valley. This balance explains Sin Zin’s restaurant popularity; it is always a food friendly style of Zinfandel. After fermentation the wine was aged for fourteen months in American oak barrels to add depth, complexity and texture. There is a spicy, earthy nose and the aromas of dark fruits, raspberry and vanilla hint at the luscious fruit in this dark purple, red-hued wine. There is great up front fruit with big flavors of black cherry, plum, chocolate and black pepper. This is a rich Zinfandel with good balance, chewy texture, nice acidity and a long, spicy finish.